Advanced Cones has been updated. Large number of bugfixes, some text changes. Prolate hemispheroid now has a “smooth tip” option. Objects correctly spawn at 3d cursor location, not scene center. The latest version (1.2) is compatible with Blender 2.80, users of 2.79 should use v1.1.1. Really nice work! As a future request, I’d love if this was added to the Add menu so that it can be accessed from there. It’s a little more convenient for the average user than trying to search for them by name. Yes, v1.3 will include that. Its almost done now, just working on documentation. The previous couple updates were more motivated by fixing severe bugs and getting something that would work under 2.80, so sort of a rush job. 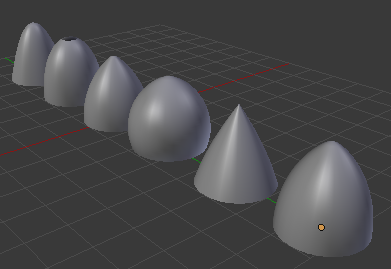 1.3 adds itself to the Add Mesh menu, supports both 2.7x and 2.8x with the same code, has a marginally more user-friendly interface, fixes even more bugs, adds one new cone shape (spherically blunted cone), and has an actually useful readme for instructions and examples. Totally understandable, and thanks for sharing your roadmap on this. I look forward to the new update whenever it’s done! It is possible that you are already planning to do what I am about to request, but just in case I am going to ask anyhow. Would it be possible to place all the ‘Advanced Cones’ together as a submenu under the ‘Add’ menu? Add > Advanced Cones > Tangent Ogive / Secant Ogive / Prolate Hemispheroid / Etc. Kind of like how the ‘Add Mesh:Extra Objects’ AddOn handles ‘Single Vert’, ‘Math Function’, 'Mechanical, ‘Torus Objects’, and ‘Extras’. It is an awesome AddOn you have shared, one that I imagine utilizing much as I transition from learning Blender to fully adopting it as my always go to 3D application. Thank you for making it that much more functional. Awesome. It is nice to know that an ‘Advanced Cones’ ‘Add’ menu consolidation is an eventual possibility. Thank you for the sharing your work in progress plan. Every update, at any pace, is always welcomed with creative glee. v1.4 is about 75% done now. Nearly feature-complete, just refactoring and optimization left. Probably will be posted by monday unless something goes wrong. Advanced cones are now under a submenu of Add -> Mesh. Added biconics (this will probably be the final new shape unless anyone else can think of any other interesting cones). Cones can now be added to existing objects in edit mode, and can be rotated at spawn. Advanced Cones v2.0 is now available, on Github.